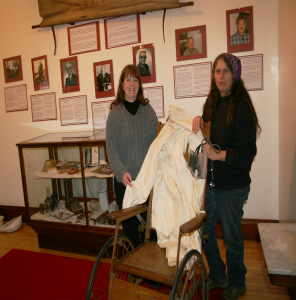 Gail Murray, left, Historical Association Executive Director, and volunteer, Deb Evans, stand next to an early wooden wheelchair, while holding up a physician's coat worn by Dr. Stuart Nelson. Many other artifacts will be on display in the Medicine Up North Exhibit that opens Friday, November 25. Photo by Carol Hansen. The Goodsell Museum, home of the Town of Webb Historical Association, will open the doors to its newest exhibit, “Medicine Up North,” on Friday, November 25. The exhibit will include a variety of artifacts, photographs and information about doctors, nurses, dentists and health care professionals, as well as the people and modes of transportation needed to move patients to medical help from the 1800s to the present day. Often, interesting facts are uncovered when researching a new exhibit topic, and this year was no exception, according to Gail Murray, executive director of the museum. “References to tuberculosis were noted, and the fresh cool mountain air was a draw bringing significant people to the area who turned out to be some of the founding fathers. Interesting stories of transporting patients by airplane, train and foot, speak to the dedication of the health care professionals in this part of the Adirondacks,” Murray said. This entry was posted in admin and tagged carol hansen, Columnists, Historical Association on November 24, 2011 by Carol Hansen. 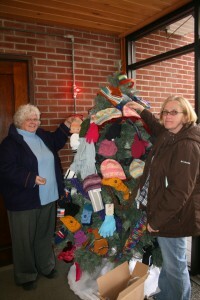 The Old Forge Fire Department Auxiliary is sponsoring a Warming Tree for donations of new or handmade hats, mittens, gloves, socks or scarves for those in need. Knitted articles are especially needed for older boys, said Jane Tormey, auxiliary president. Donations can be dropped off at the fire hall entranceway through December 14. The knitted articles will be distributed by the Kiwanis Club of the Central Adirondacks through its “Toys for Tots” program. To submit the name of someone in need of these items, contact Jane Tormey at (315) 369- 6266 or 369-8382, or any auxiliary member. Please include the ages of the individuals and sizes needed. This entry was posted in admin and tagged carol hansen, Columnists, warming tree on November 24, 2011 by Carol Hansen. The Thendara Golf Club has begun a beautification project that offers an opportunity for people to honor past and present golfers who have a passion for the historic Thendara course. 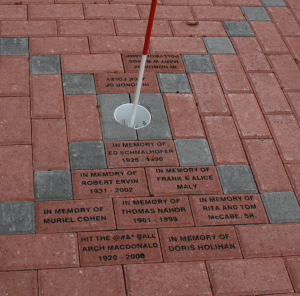 Through the new Paver Project, pavers can be purchased and inscribed with messages to either memorialize a golfer who has passed, or to celebrate a personal golfing milestone. 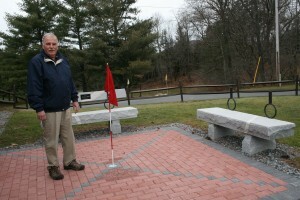 Dave Barker, Club board member and project chairman, said a 12’ by 12’ space—featuring 400 pavers—has been designated as a Memorial area, while pavers on the porch can be purchased to acknowledge such feats as a hole-in-one, winning a club championship, or simply playing one’s best golf match ever. The idea for the Paver Project was suggested by past-board member Jerry Britton, who was inspired by a similar fundraising beautification effort at Constableville Hall. This entry was posted in admin and tagged carol hansen, Columnists, Golf Club, Thendara on November 24, 2011 by Carol Hansen. With the absentee ballots finally counted, Kathleen Farber of the Herkimer County Board of Elections has announced that Republican Theodore C. Riehle, Jr. will serve as the Town of Webb’s Supervisor. Riehle received 72 more votes than his closest challenger, Independent candidate H. Stuart deCamp, following the opening of 162 Webb absentee ballots. Riehle was also challenged by Democrat Dave Berkstresser and Independent candidate Richard S. Risley. This entry was posted in admin and tagged Dana Armington, election, results, Town of Webb on November 24, 2011 by Dana Armington. The Eagle Bay Fire Department will host a Tree Lighting Party on Saturday, December 3, sponsored by the Ladies Auxiliary and the Town of Webb. The event will begin with caroling and the community Christmas Tree Lighting at 6 p.m. at the corner of Big Moose Rd. and Route 28. Following the tree lighting, all are invited to bring a dish to pass and enjoy an evening with friends and neighbors. Soups, food, and desserts will be provided. Santa will be making an appearance to bring Christmas gifts for the young kids. This entry was posted in admin and tagged eagle bay, tree lighting on November 24, 2011 by admin. North Woods Masonic Lodge # 849 of Old Forge will be collecting furniture and small appliances that will ultimately be distributed to those who have lost so much in the floods in and surrounding the Schoharie Valley area. This entry was posted in admin and tagged Andrew Getty, Letters to the Editor on November 24, 2011 by admin. Mountain Theatre Company and View would like to thank the community for supporting their recent spaghetti dinner and theatre performance of “Over the River and Through the Woods” on Sunday, November 20. This entry was posted in admin and tagged Letters to the Editor, Saban on November 24, 2011 by admin.